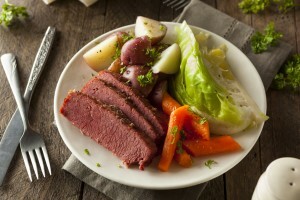 Here are some of the most classic and sought after St. Patrick’s Day dishes that any leprechaun would devour! Kick your meal and festivities up a notch with these dishes that will transport you to Ireland. Short on time? Well, this recipe will pretty much make itself! 1. Combine the water vinegar, sugar, pepper and onions, in a 6 qt crock pot and mix well. 2. Place corned beef and contents of spice packet in the mixture. 3. Scatter the potatoes and carrots over the top and along the sides. 4. Cover and cook on high heat setting 4 hours. 5. Remove the lid and scatter the cabbage wedges over the top. 6. Cover and continue cooking on high 3-4 hours longer, or until beef is tender. 7. To serve, carve the beef into slices against the grain and serve with the cabbage and potatoes, with some of the cooking liquid spooned on top of the beef to keep it moist. 1. Heat the oil in a large skillet over medium heat. Toss beef cubes with flour to coat, then fry in the hot oil until browned. Place the carrots, potatoes, onion and garlic in a large slow cooker. Place the meat on top of the vegetables. Mix together the beef broth and tomato paste and pour into the slow cooker. 2. Cover and cook on High for 6 hours or Low for 8 hours. During the last hour before serving, dissolve the cornstarch in cold water and then stir into the broth. Simmer on the High setting for a few minutes to thicken. 1. Boil the potatoes: place peeled and quarters potatoes in medium size pot. Cover with an inch of cold water. At a teaspoon of salt. Bring to a boil, reduce to a simmer, cook until tender (20 minutes). 3. Add the ground beef, then Worcestershire sauce and broth: Add ground beef to the pan with the onions and vegetables. Cook until no longer pink. Season with salt and pepper. Add the Worcestershire sauce and beef broth. Bring the broth to a simmer and reduce heat to low. Cook uncovered for 10 minutes. 4. 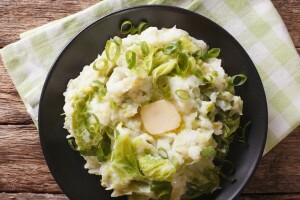 Mash the cooked potatoes: When the potatoes are done cooking, remove them from the pot and place them in a bowl with the remaining 4 Tbsp. of butter. Mash with a fork or potato masher, and season with salt and pepper to taste. 5. 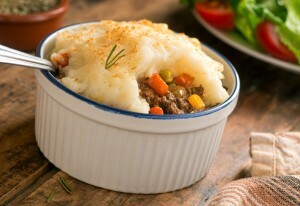 Layer the meat mixture and mashed potatoes in a casserole dish: Preheat oven to 400°F. 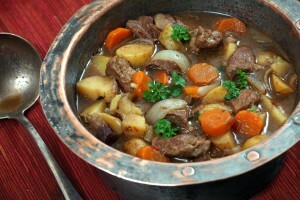 Spread the beef, onions, and vegetables (if using) in an even layer in a large baking dish (8×13 casserole). Spread the mashed potatoes over the top of the ground beef. 6. Bake in oven: Place in a 400°F oven and cook until browned and bubbling, about 30 minutes. If necessary, broil for the last few minutes to help the surface of the mashed potatoes brown. A classic potato dish that any Irishman would love! 1. Place potatoes in a Dutch oven, cover with water. Bring to a boil. Cover and cook over medium heat for 12-15 minutes. Add the cabbage during the last 5 minutes of cooking. 2. In a small saucepan, combine green onions and milk. Bring to a boil. Reduce heat; simmer, uncover, for 5-6 minutes. 3. Drain potato mixture. Mash with milk mixture, butter, salt and pepper. Because no St. Patty’s day is complete without dessert! 1. Blend ice cream, milk, peppermint extract, vanilla extract and food coloring in a blender until smooth. 2. 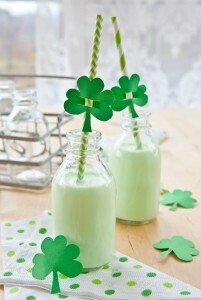 Pour into one or two serving glasses and garnish with whipped cream and sanding sugar.